Discover the best places to eat lunch in St Barths, Anguilla, Grenada and St Lucia — whether you're looking to try local delicacies or luxurious fine dining, there's a place for every foodie to enjoy a meal in the shade out of the midday sun. 1. The Calabash Beach Club The Calabash Beach Club (formerly the Bash) has revamped its menu to include more local dishes — it now serves rotis, pumpkin and coconut risotto and jerk chicken alongside its tapas and cocktail offering. You can enjoy the Beach Club's simple and light plates in an open and airy restaurant that's mere seconds away from the sea. Take a relaxing dip between courses or spend the afternoon exploring the nearby Prickly Bay, one of the best scuba diving spots in the Caribbean. Discover the best places to eat lunch in St Barths, Anguilla, Grenada and St Lucia — whether you're looking to try local delicacies or luxurious fine dining, there's a place for every foodie to enjoy a meal in the shade out of the midday sun. The Calabash Beach Club (formerly the Bash) has revamped its menu to include more local dishes — it now serves rotis, pumpkin and coconut risotto and jerk chicken alongside its tapas and cocktail offering. You can enjoy the Beach Club's simple and light plates in an open and airy restaurant that's mere seconds away from the sea. Take a relaxing dip between courses or spend the afternoon exploring the nearby Prickly Bay, one of the best scuba diving spots in the Caribbean. 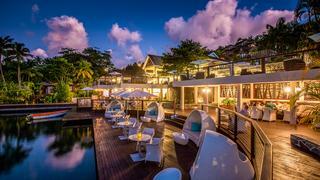 Bamboo Bar & Grill at the newly transformed Four Seasons Anguilla has been renovated but without big changes to the menu, offering the ultimate barefoot luxury and fine dining experience. "It’s a popular lunchtime venue because we’re right on the beach and people come ashore from their yachts," says Bamboo head chef Darren Connor. "We’ve had a lot of stars visiting, especially basketball players – LeBron James, Shaquille O’Neal, Michael Jordan – because we host training camps here. 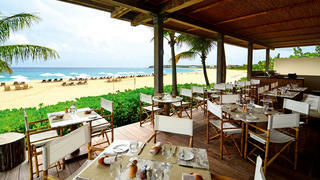 "The big dining change at the resort is the executive chef Rafael Gonzalez’s restaurant, Coba. The emphasis is shifting from steak to fish and local ingredients – it’s a stylish seafood grill, with the island’s only ceviche bar." 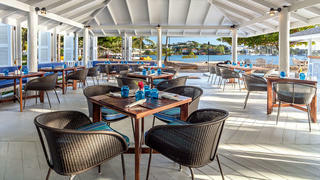 Bamboo Bar & Grill at the newly transformed Four Seasons Anguilla has been renovated but without big changes to the menu, offering the ultimate barefoot luxury and fine dining experience. "It’s a popular lunchtime venue because we’re right on the beach and people come ashore from their yachts," says Bamboo head chef Darren Connor. "We’ve had a lot of stars visiting, especially basketball players – LeBron James, Shaquille O’Neal, Michael Jordan – because we host training camps here. 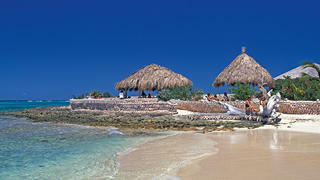 "The big dining change at the resort is the executive chef Rafael Gonzalez’s restaurant, Coba. The emphasis is shifting from steak to fish and local ingredients – it’s a stylish seafood grill, with the island’s only ceviche bar." 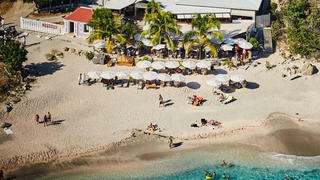 Do Brazil is a barefoot dining destination originally owned by French Open tennis champion Yannick Noah, on the sheltered Shell Beach, just behind the port of Gustavia. It's casual, laid back and has plenty of shady spots, it's the perfect lunch spot for recovering after the night before. The food is light and simple, which is perfect if you want to go for a swim afterwards — if you stay all day, sit back and enjoy one of the best Caribbean sunset spots. Do Brazil is a barefoot dining destination originally owned by French Open tennis champion Yannick Noah, on the sheltered Shell Beach, just behind the port of Gustavia. It's casual, laid back and has plenty of shady spots, it's the perfect lunch spot for recovering after the night before. The food is light and simple, which is perfect if you want to go for a swim afterwards — if you stay all day, sit back and enjoy one of the best Caribbean sunset spots. Popular with yachties due to the anchorage in Marigot Bay, the pool bar at Capella Marigot Bay serves light dishes, including sushi with local fish — tuna, lionfish, mahi-mahi, octopus. Additionally, diners can cool off at this iconic yachty watering hole with a Caribbean beer or frozen cocktail, though keep an eye out for the midday appearance of a rum barrel filled with fresh coconut water. Popular with yachties due to the anchorage in Marigot Bay, the pool bar at Capella Marigot Bay serves light dishes, including sushi with local fish — tuna, lionfish, mahi-mahi, octopus. Additionally, diners can cool off at this iconic yachty watering hole with a Caribbean beer or frozen cocktail, though keep an eye out for the midday appearance of a rum barrel filled with fresh coconut water. Scilly Cay just of Anguilla is a tiny island reached only by boat and it's the perfect dining spot for inbetween snorkelling excursions. There’s not much there except sand, sea grape trees and the restaurant, so the menu is simple – lobster, crayfish or chicken grilled over charcoal, served with pasta salad. If a bit of peace and quiet with white sand and turquoise waters, Scilly Cay might be the Caribbean island that best suits you and your superyacht. Scilly Cay just of Anguilla is a tiny island reached only by boat and it's the perfect dining spot for inbetween snorkelling excursions. There’s not much there except sand, sea grape trees and the restaurant, so the menu is simple – lobster, crayfish or chicken grilled over charcoal, served with pasta salad. If a bit of peace and quiet with white sand and turquoise waters, Scilly Cay might be the Caribbean island that best suits you and your superyacht. Pick up some sandwiches and quiches at La Petite Colombe bakery in Lorient before hiking up to the cliffs near Toiny to one of the Caribbean's best picnic spots. Head towards the natural freshwater pools there called the Washing Machine, where you can watch the swirling waves and tuck into your baked treats. Nearby, on Anse de Grand Fond, there are many sea urchins near the shore — though it is prohibited to collect them, it's a must-see spot in St Baths. Pick up some sandwiches and quiches at La Petite Colombe bakery in Lorient before hiking up to the cliffs near Toiny to one of the Caribbean's best picnic spots. Head towards the natural freshwater pools there called the Washing Machine, where you can watch the swirling waves and tuck into your baked treats. 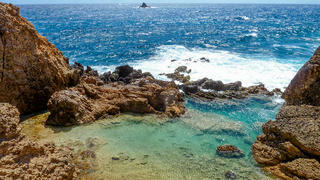 Nearby, on Anse de Grand Fond, there are many sea urchins near the shore — though it is prohibited to collect them, it's a must-see spot in St Baths.